Laura is a UK born who lives in Germany. She does amazing rainbow colors art, thank kind of art that chatches your eyes at the first glance! I asked her to share with us the best supplies to craft glitter rainbows and she kindly sent me all the details. "I only use holographic glitter as that is the sparkliest", told me Laura. To glue the gliiter on the wood, she uses Mod Podge Gloss. "There is kind of a special technique I use to keep the glitter on but which is a mixture I make of mod podge with water for the second coat. I do this by look and feel though and can’t really explain that easily on message 🌈 hope this has helped a little 💖". Who is ready to try? 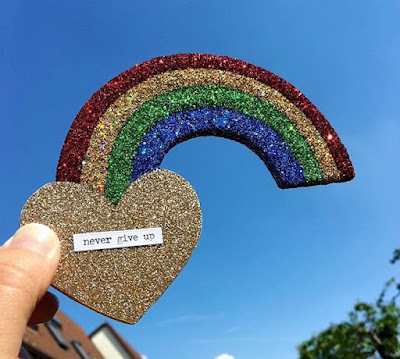 For more rainbow ideas check out Instagram Share a Rainbow Day.